File sharing is an essential part of collaboration, and more and more sensitive data is being shared both internally and externally. However, sharing outside the organization’s security perimeter makes that sensitive data vulnerable to security threats. 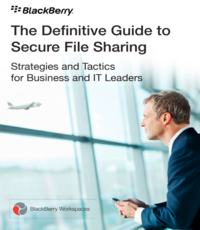 Download this extensive eBook to learn everything you wanted to know about Enterprise File Synchronization and Sharing (EFSS), why it’s a must-have for security-minded organizations of all sizes and what evaluation criteria you must consider when selecting an EFSS solution.